Under observation. 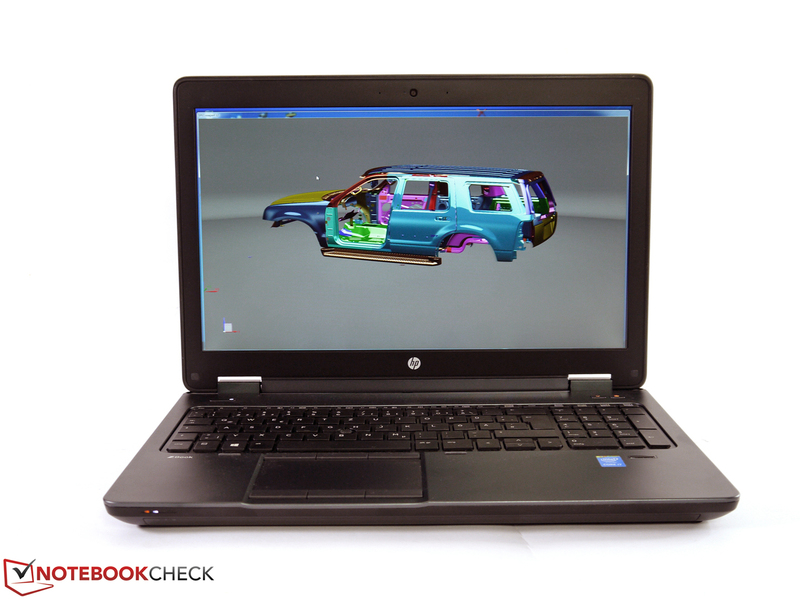 HP's ZBook 15 G2 is a high-performance, mobile workstation that is to particularly convince with an especially good reliability in the professional field. The lineup already reaped in compelling rates in the standard test procedure. A second test configuration now has to prove whether that remains that way in the long run in the debut of our long-term test. 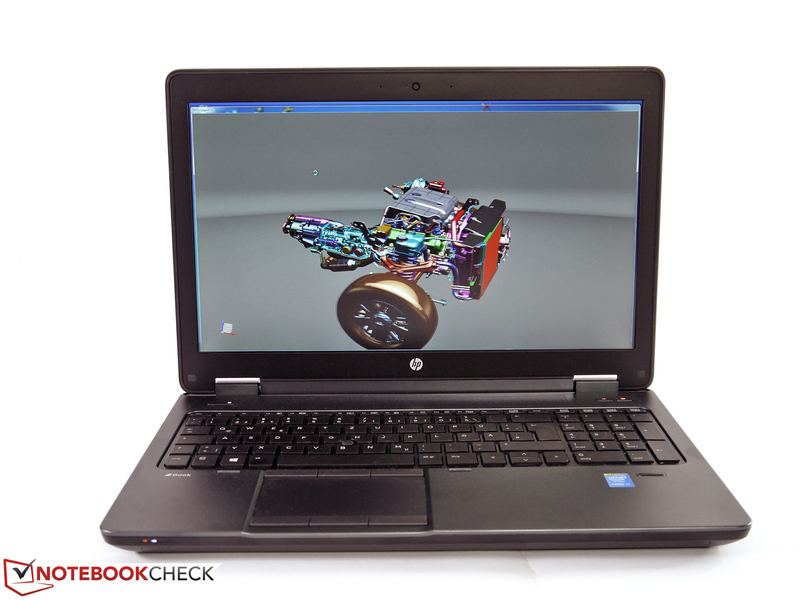 HP's ZBook 15 G2 is a typical mid-range workstation that includes a good diversity of interfaces, extensive upgrade options, and, of course, practices suitable performance besides acceptable mobility. 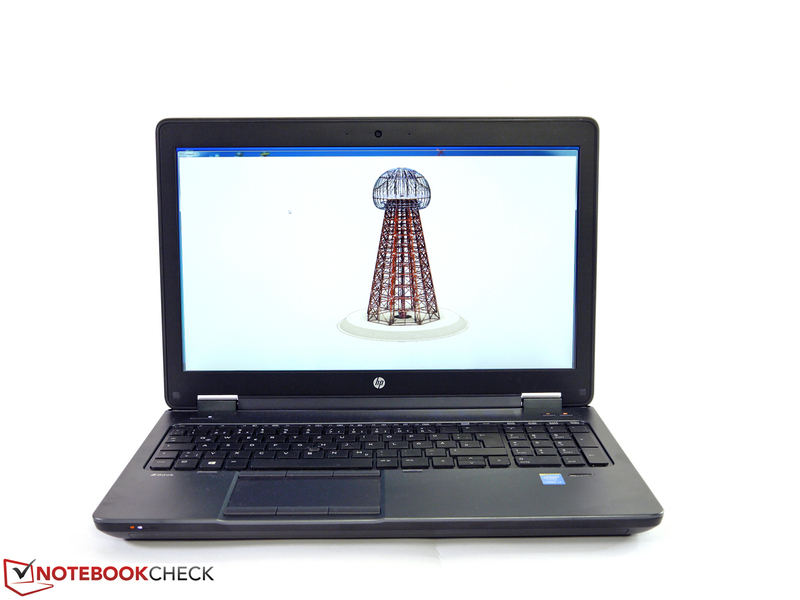 HP's ZBook 15 G2 had to deal with some configuration-related drawbacks in the first test. The conventional hard drive slowed down the system performance, and the high resolution QHD+ screen prevented using switchable graphics. Furthermore, the battery designed for a long service life had a slightly lower capacity than the standard model used now. The present review sample rectifies these minor drawbacks and also sports a somewhat more generous configuration fused with higher computing power. The current review model features an Intel Core i7-4910MQ CPU, 32 GB of RAM, a 256 GB PCIe solid state drive (Z Turbo Drive), two 1 TB hard drives, AMD's FirePro M5100, and a UWVA Full HD screen. HP demanded roughly 4360 Euros (~$4882) for our review sample with Windows 7/8 on 02/08/2015 in its online product configurator. As announced, this review sample will remain with us for much longer than usual, and it will have to exhibit the long-term qualities as a representative of this mobile workstation for a period of five months. We decided to split the project in two in order to implement this undertaking. The following standard test marks the start of this long-term test. It is to ascertain this test configuration's capabilities in the usual test procedure. 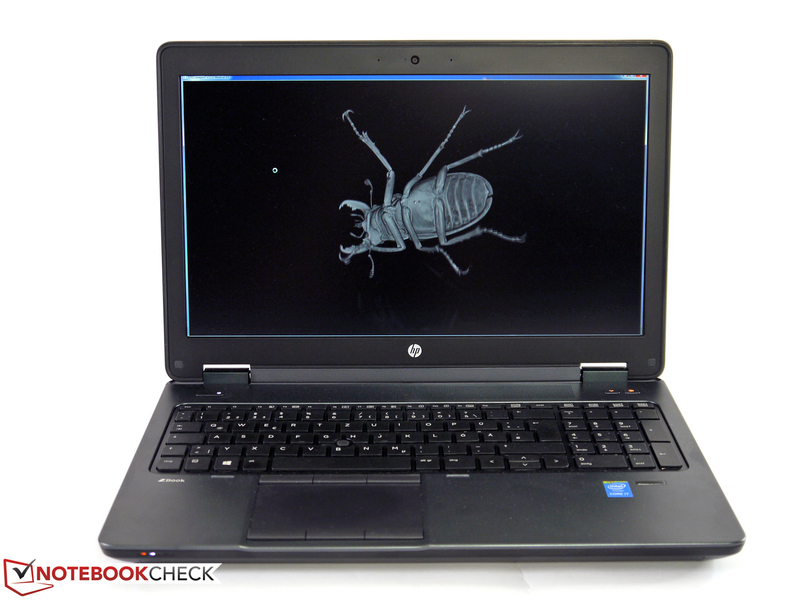 In a second follow-up article, we will especially focus on the long-period experiences we made with HP's new ZBook 15 G2. That can include everything that involves the review sample - from a short status report up to an in-depth accessories test. We will naturally take a special look at the long-term qualities. However, the endurance under permanent load, mobile properties or the use of different peripherals will, of course, also be considered. Beyond that, we have also planned a few special topics that deal with system-specific and supplementary accessories. We would also like to look closer at the upgrade and configuration options in practice. We made a to-do list of the planned projects to-date. They will be regularly dealt with in a long-term review article. We are naturally open for suggestions from our readers. Therefore, if you have any questions related to the ZBook 15 G2, we will try to implement them accordingly or incorporate them into the planned tests. Ideas can be posted in the forum thread of this review or in the long-term test article. 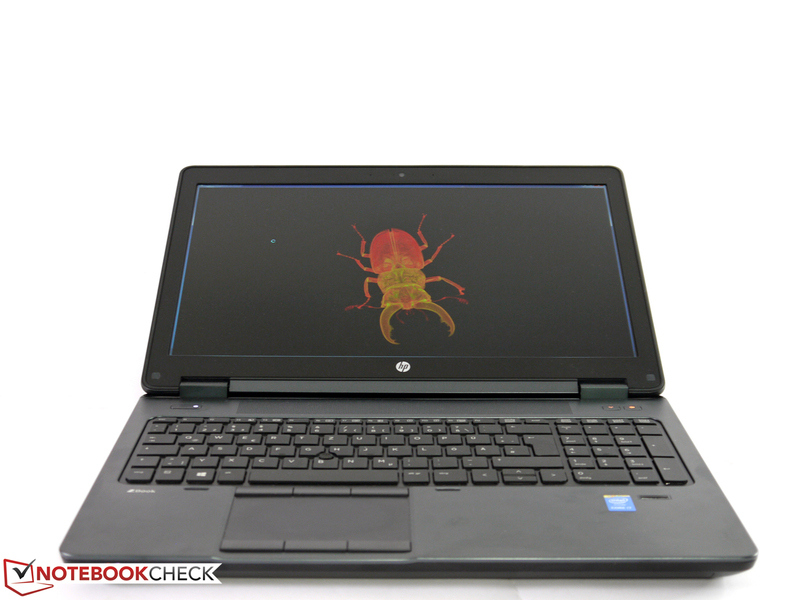 HP's ZBook 15 has already proved its good casing qualities in multiple tests. Build, stability, and choice of materials are absolutely convincing, and they barely give reason for complaint. Only the dimensions of the bulky-looking 15-inch device and the related weight of over 3 kg restrict the potential application scenarios. In view of the provided core qualities that are expected from a conventionally designed workstation, it is an inevitable compromise. Mobile, slim-line design workstations usually do not have modular bays, docking ports or an extensive diversity of interfaces. The upgrade options are also sooner limited, and require the willingness for major concessions. 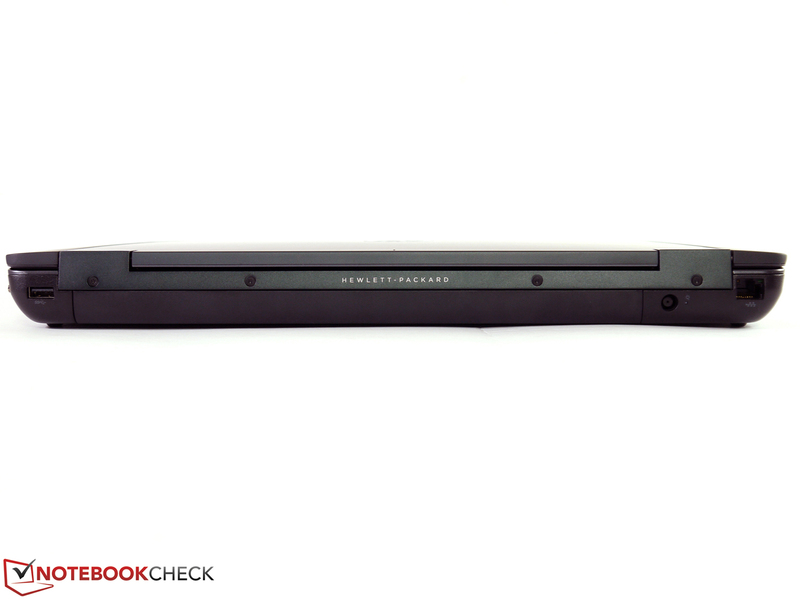 In contrast to its precursor, HP's ZBook features Thunderbolt 2, a particularly high-speed PCIe interface (Z Turbo Drive, M.2 SSD) as a fundamental innovation. 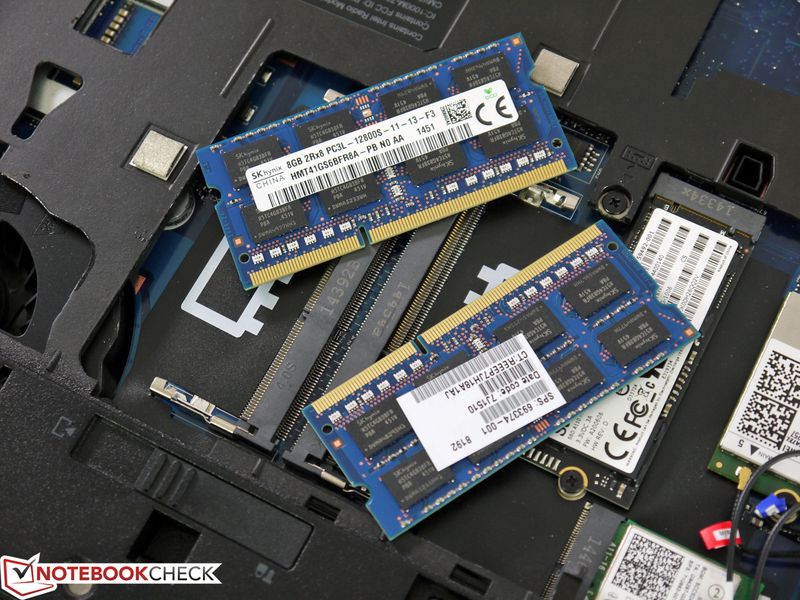 The hardware-limiting SATA III is eliminated, making the use of especially fast SSD modules possible. Otherwise, the usual ports are installed in the casing. They are distributed quite evenly over all three sides. Only the DisplayPort, Thunderbolt 2 and USB 3.0 are cramped a bit on the left, and accessing them could also be awkward when the ExpressCard/54 slot arranged in front of them is equipped with a corresponding expansion. The interfaces are complemented with an analog VGA, a card reader, and a combo-audio jack. The performance of the tested interfaces is good. 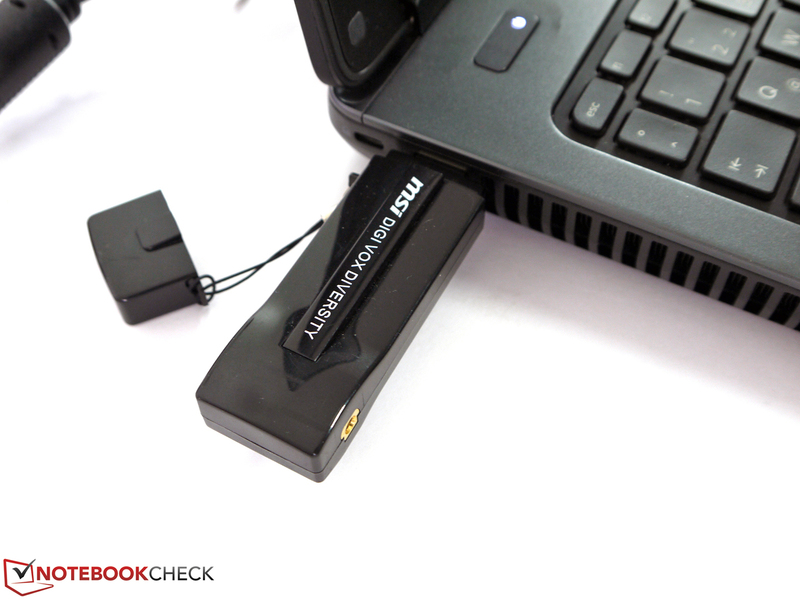 The card reader operates in the UHS I standard, and thus supports theoretical data rates of up to 104 Mbps. A Toshiba Exeria Pro UHS II with a capacity of 16 GB achieves 86 Mbps in read and 69 Mbps in write. 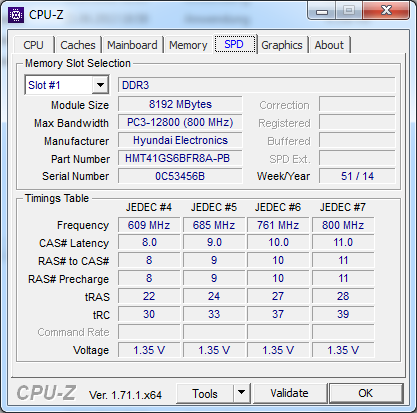 This card accomplishes around 200 Mbps with a UHS II reader. Our Seagate GoFlex Thunderbolt adapter that is not explicitly specified for Windows systems is identified, but not the connected drives. 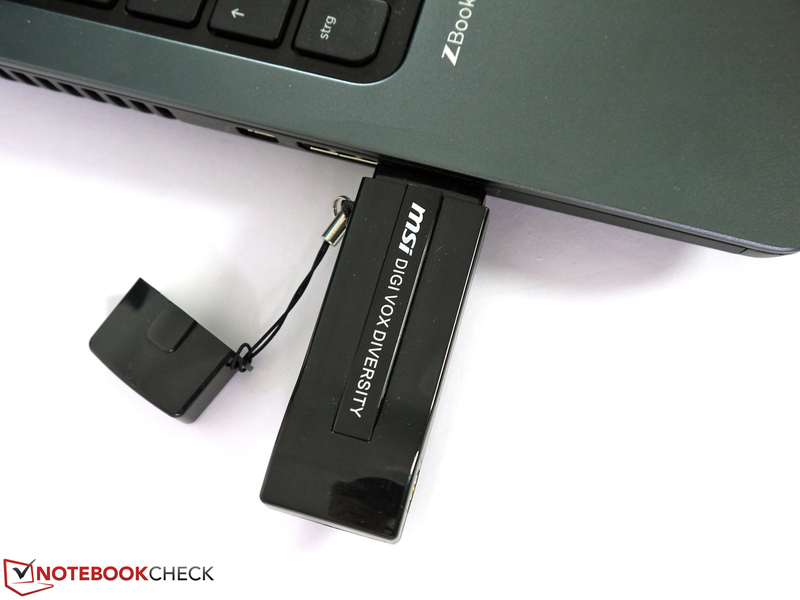 Since we will have the review sample for a while, we will examine external storage devices, including the Thunderbolt, in the ZBook 15 G2 more intensively. 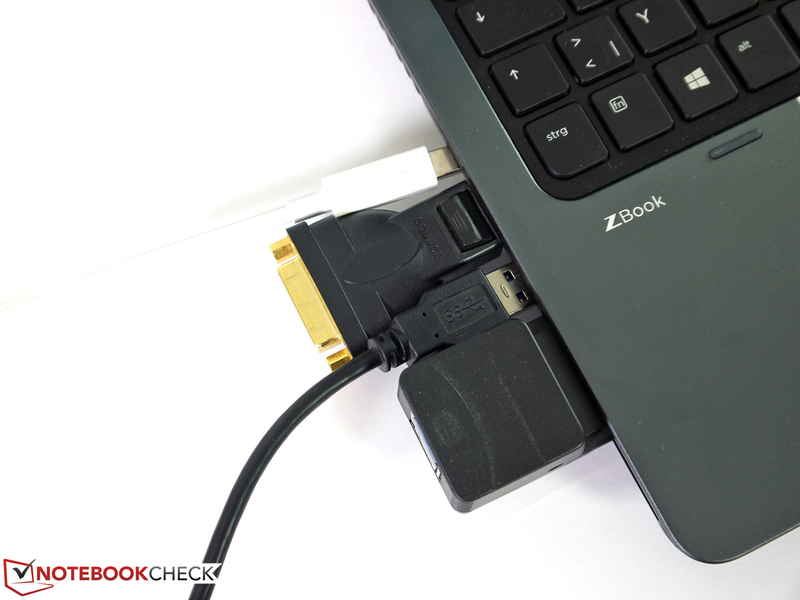 The USB 3.0 port achieved a maximum of 221 Mbps in our test with various external drives (Samsung SSD T1, OCZ Vector 150 w/ UASP USB 3.0 connector) and seems to limit the transfer speeds in this sector. However, the USB 2.0 port delivers very good results that come quite close to the theoretical performance with almost 40 Mbps. The communication equipment includes a speedy dual-band Wi-Fi module that supports the high-speed 802.11 ac standard in the 5 GHz band besides the compulsory HD webcam and the corresponding internal microphones and a Gigabit LAN port. 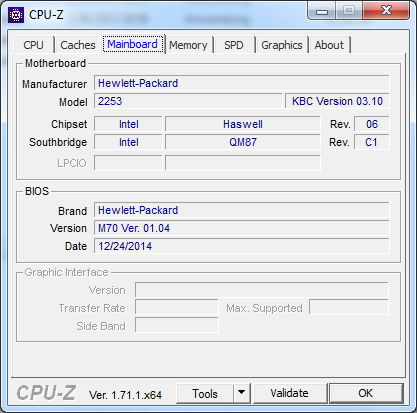 Beyond that, Intel's 7260ac integrated Bluetooth 4.0 is included, and thus all required basic standards are covered. Our review sample achieved a data rate ranging from 2 Mbps to 9.7 Mbps, depending on the distance to a Fritz!Box 7490 in the Wi-Fi performance test. Our present review sample sports an HP HS3110-HSPA+ module for mobile Internet connections. It delivers up to 21 Mbps in download and 5.76 Mbps in upload. As usual, the associated SIM slot is in the battery compartment. HP also has higher performance modules, such as ones that support the LTE standard, available. A fingerprint scanner, SmartCard reader, Computrace service, Anti-Theft and a Trusted Platform module (TPM 1.2) extensively supplement the standard password and software features. 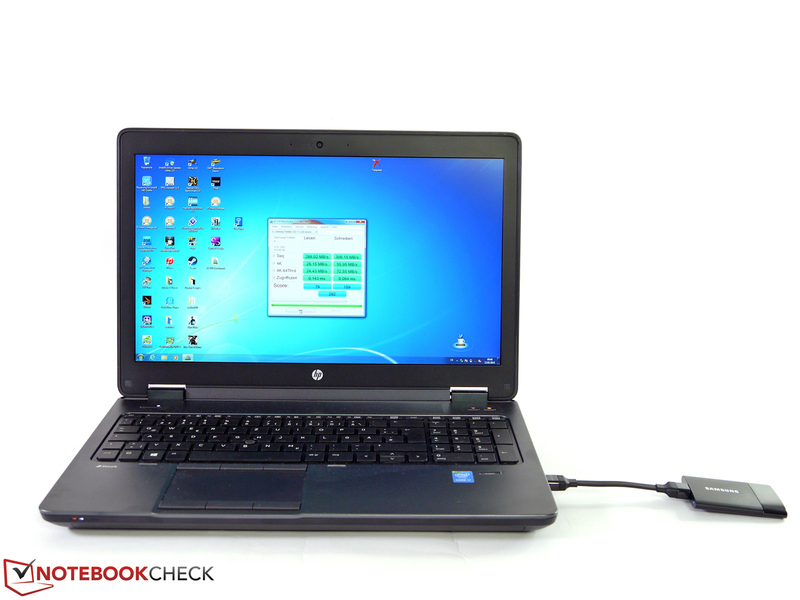 Thus, HP's ZBook 15 G2 is on the usual business level and offers multiple security options against potential data theft. Additionally, single ports can be disabled in the BIOS, making it impossible to transmit data from the outset. Finally, the integrated Kensington lock allows protecting the physical device against theft via a cable lock. That is primarily important when the user often participates in public events or works in public areas. HP has an extensive portfolio of system-specific accessories and thus offers additional expansion options. Docking stations, secondary batteries, and modular drives belong to classic workstations like icing on a cake and represent the typical requirements of demanding corporate customers. HP's Advanced Docking Station (product number: A7E38AA#ABB) costs around 270 Euros (~$302) and provides older standards like DVI, serial and parallel interfaces besides modern ports. As mentioned, we will examine the accessories sector more closely in the course of the long-term test and also perform some practical tests. 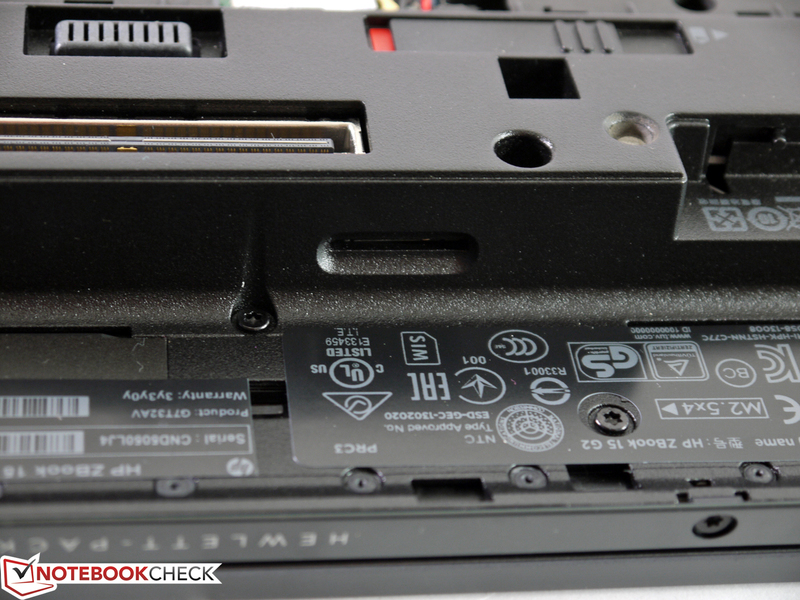 HP has used exemplary easy-to-open and thus extremely practical base plates for years. After releasing the slider, the screw-less base plate can be lifted off, making it possible to access the device's important components. Only accessing the RAM slots under the keyboard or swapping the modular drive is a bit more difficult. A screwdriver and a few minutes of time are needed. As usual, the warranty information should be read before doing anything so that the warranty is not unnecessarily voided. 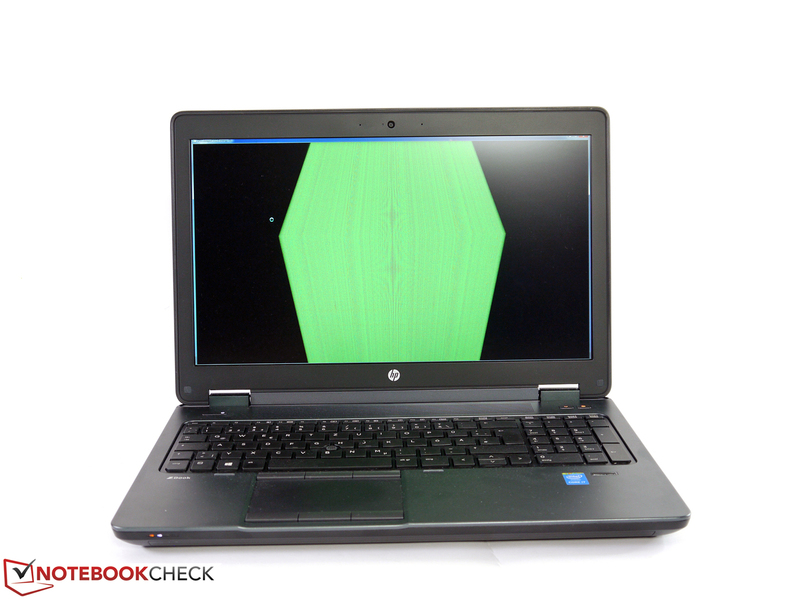 HP includes a manufacturer's warranty of 36 months on its ZBooks, which is category standard. Beyond that, multiple additional services and warranty upgrades are available for a surcharge. For example, HP currently demands additional 327 Euros (~$366) for a five-year on-site service for the next business day. 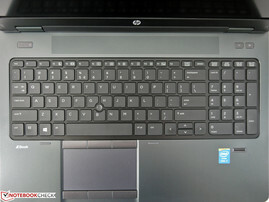 The keyboard is suitable for prolific writers and is inserted firmly over the entire surface. There is no sign of rocking or stiff-running single keys. The subjective typing feel can be called good after a short time, and it makes the impression of a high-quality keyboard solution. The layout is straightforward, and the keys' size in a 19 mm grid is throughout sufficient. Only the vertical arrow keys could have been bigger and more generously spaced. The dedicated number pad facilitates entering long rows of numbers. 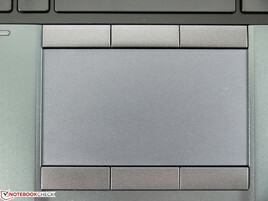 However, it is also the reason that the touchpad has been moved to the left in line with the space bar. That needs some getting used to and will not appeal to every user. 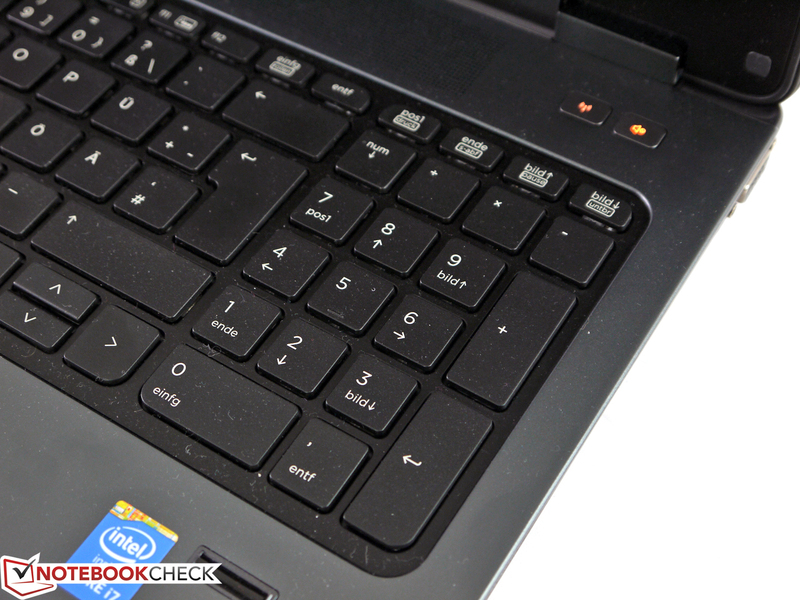 The touchpad's size of 103 x 59 mm is agreeably generous and features very good touchpad and TrackPoint buttons. They can be customized and are a notable added value in contrast to the fashionable, but also often functionally inadequate ClickPads. The gliding properties are superb and convey an accurate and swift feedback. 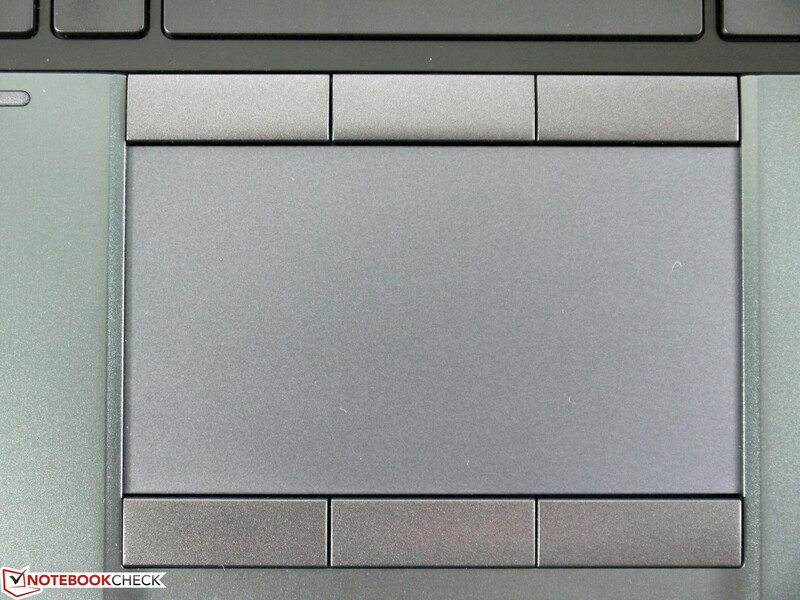 As a welcome input alternative, HP's ZBook 15 features a TrackPoint as usual, which can be controlled very precisely as a mouse and touchpad replacement. Great that HP opposes the general trend and does not waive it. HP presently offers three different display models for its ZBook 15 G2. 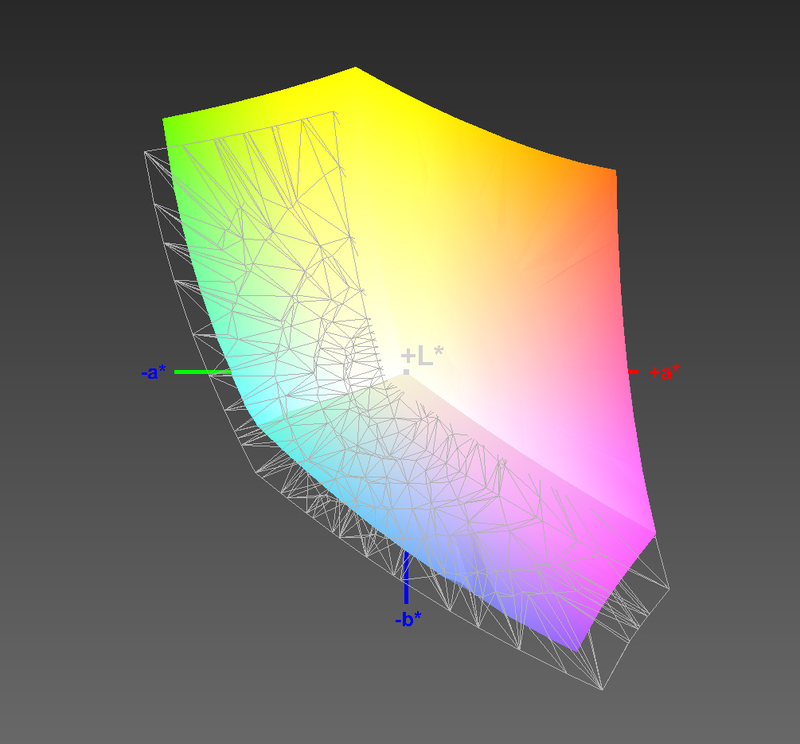 The still available DreamColor screen from the precursor, which had a particularly large color space, has been axed. We opted for the UWVA Full HD screen in our present test model because the resolution (1920x1080 pixels) does not have system-related scaling problems and nothing opposes the use of switchable graphics. The review sample sports an IPS screen from Samsung (SDC5344), which is also used in HP's Omen, for example. We previously examined the high-resolution QHD+ display in the first review sample. HP also offers a Full HD screen (SVA) with limited viewing angles as an entry-level model, which does not seem very recommendable for professional usage and demands. Only users who are rarely on the go and mostly work with external monitors, and also want to take advantage of every possibility of saving, should consider this alternative. 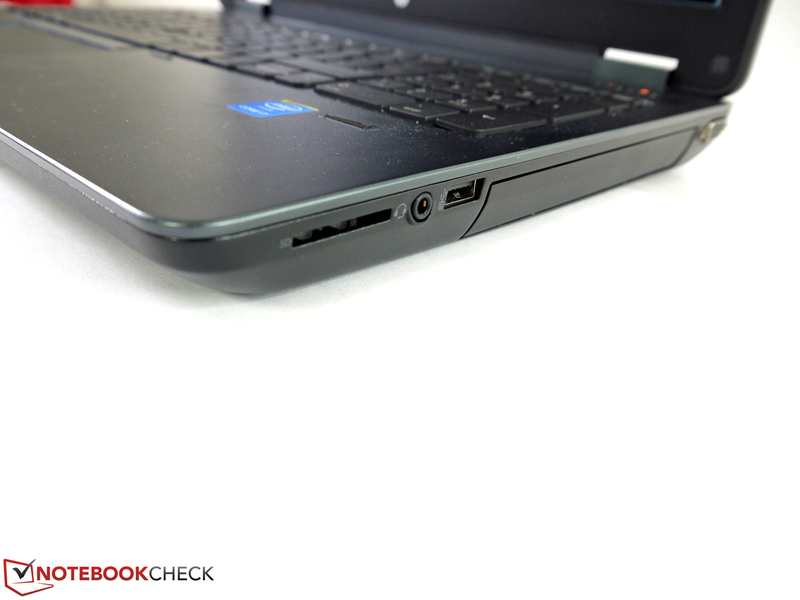 The expected qualities should be comparable with the rates of the Full HD screen in HP's EliteBook 850. Our UWVA Full HD screen has a matte surface that very successfully reduces reflections to a minimum. Only a vague mirroring of light sources or large, bright surfaces was ascertained, depending on the display's position. 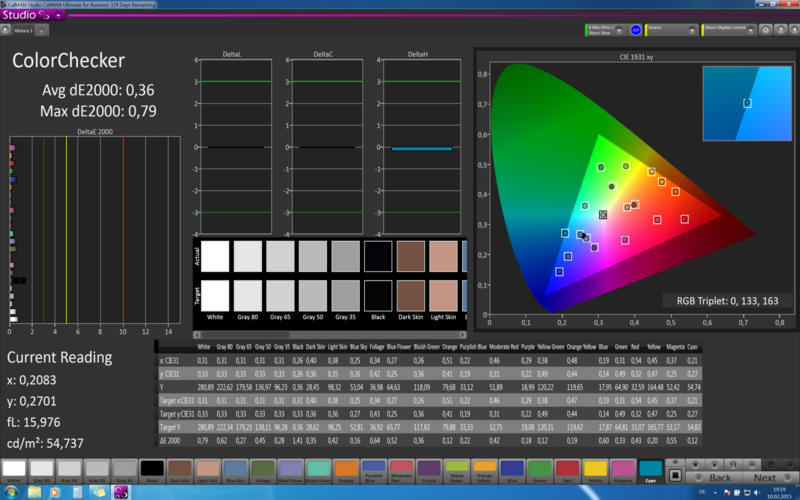 We ascertained a screen brightness ranging from 261 to 309 cd/m² in our usual nine measuring points. 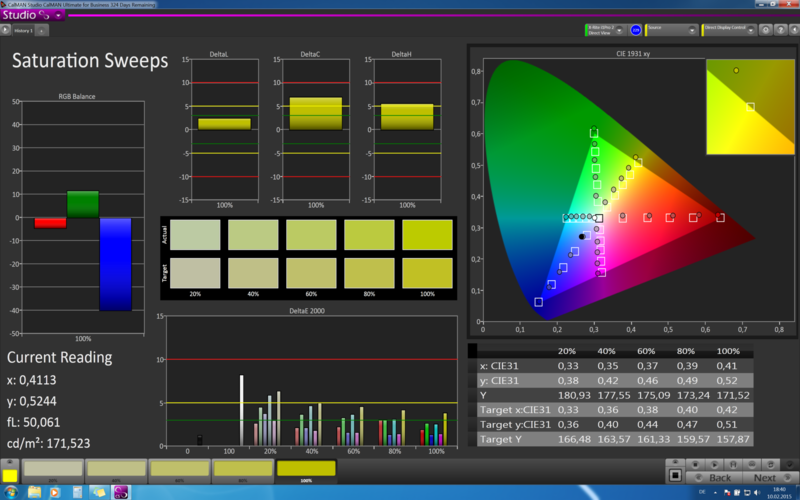 That equals an average of 389 cd/m² and an illumination of 84%, which is rather moderate for professional use. While the screen's brightness remains stable with around 300 cd/m² in the upper two-thirds, it gradually decreases consistently to approximately 270 cd/m² in the lower third. Although that is vaguely perceptible when looking closer, it should not have an adverse effect in practical use. The brightness can be set from 15 cd/m² to its maximum in 20 steps, which thus allows sufficiently fine adjusting. We measured 163 cd/m² in the brightness level of 16. That is an ergonomic setting for many indoor situations. We also use this setting for our Wi-Fi and videos tests. The maximum brightness level will be used outdoors so that content is displayed as clearly as possible. Apart from direct sunlight, outdoor use is well possible and only requires minor restrictions in regard to the screen's alignment. The screen's full brightness is available in battery mode. Although the measured contrast of 657:1 is not a top rate, it provides an appealing black and useful, rich colors. 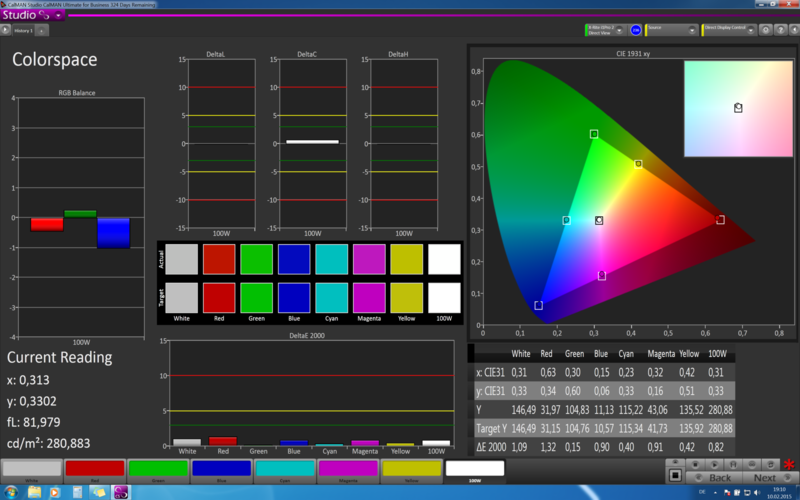 The supported color space covers 83% of the sRGB color space and 63% of the AdobeRGB color space. A sufficiently balanced reproduction of the colors and grayscale levels for professional use cannot be expected in state of delivery. Since calibration is unavoidable in the fields of graphics and image editing, that should not be a major drawback. A virtually impeccably balanced screen is available after using X-Rite i1 Pro 2. It comes very close to the specifications with a maximum DeltaE 2000 of 1.4 in the grayscale levels, 1.3 in the primary colors, and 0.64 in the mixed colors. 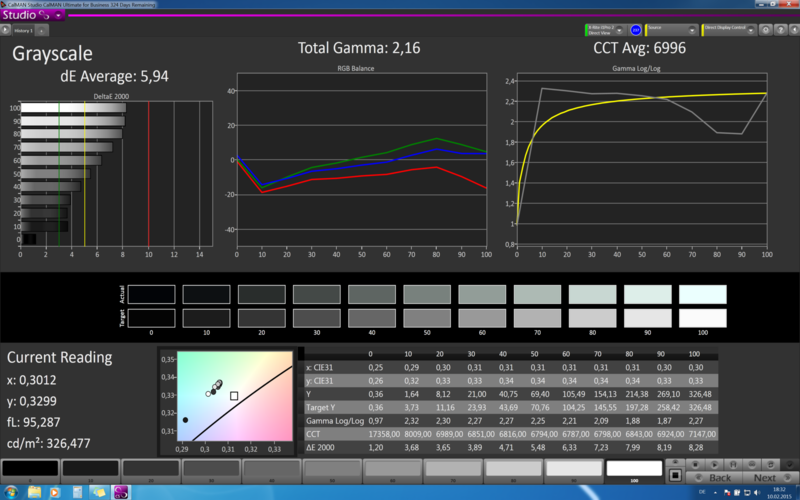 The sRGB balance, the gamma curve's accuracy, and the color temperature are also very good. 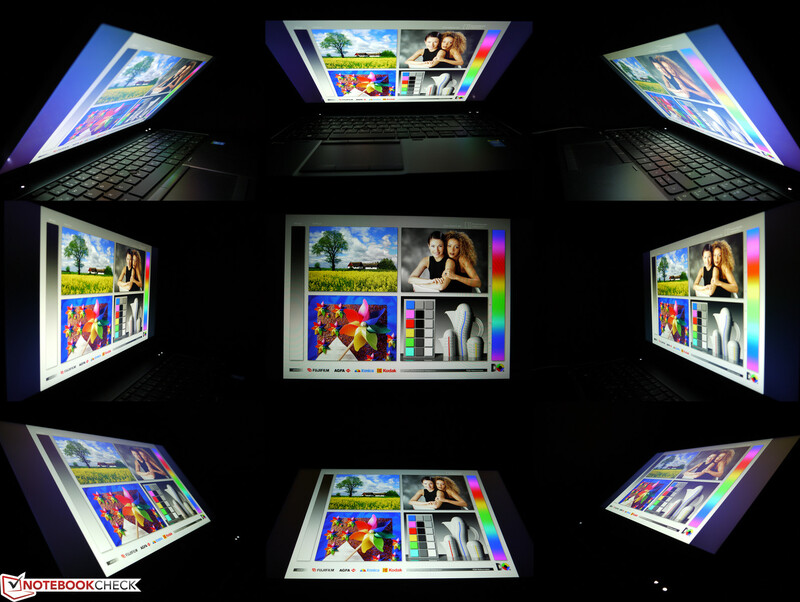 The viewing-angle stability of Samsung's display is very good and exhibits a virtually perfect image from all sides. If at all visible, colors and brightness shifts are very minor and are only noticed on solid-colored content. 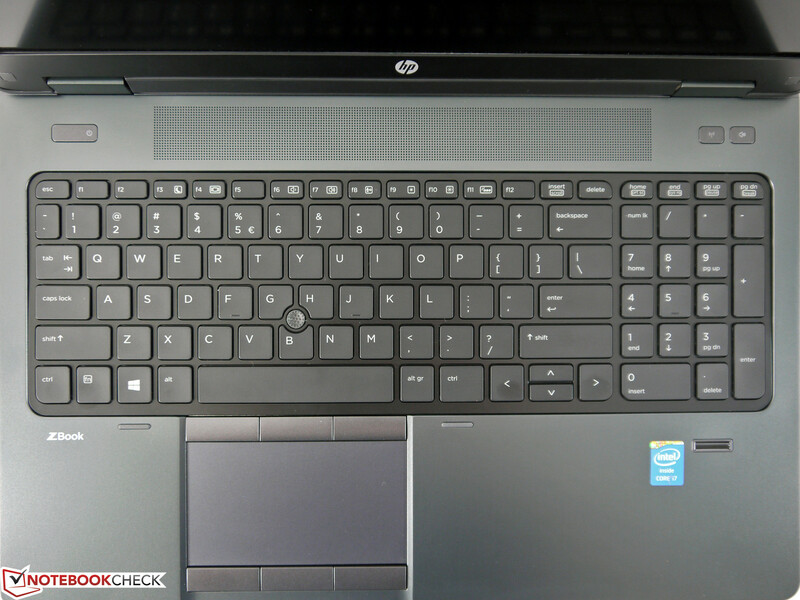 As common for this device category, HP offers countless configuration options. 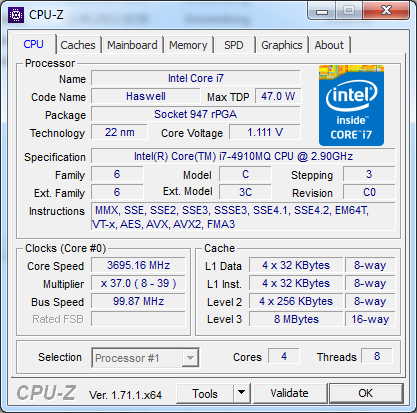 Starting with an Intel Core i5-4340M up to an Intel Core i7-4910MQ, there are 5 different CPUs in the configuration lists. Furthermore, there are 4 different graphics options that include the to-date available Nvidia Quadro K610M, K1100M and K2100M, as well as AMD's FirePro M5100. The performance equipment is finished off with a maximum of 32 GB RAM and various storage device combinations, and it should enable a suitable configuration for virtually every application field. Stress test after 1 min. Stress test after 22 min. Stress test after 122 min. 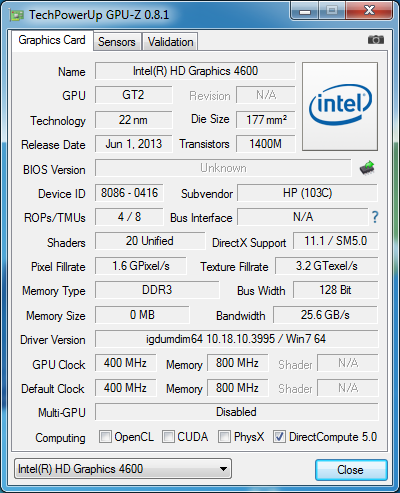 We could equip our present review sample with Intel's Core i7-4910MQ (TDP: 47 watts). 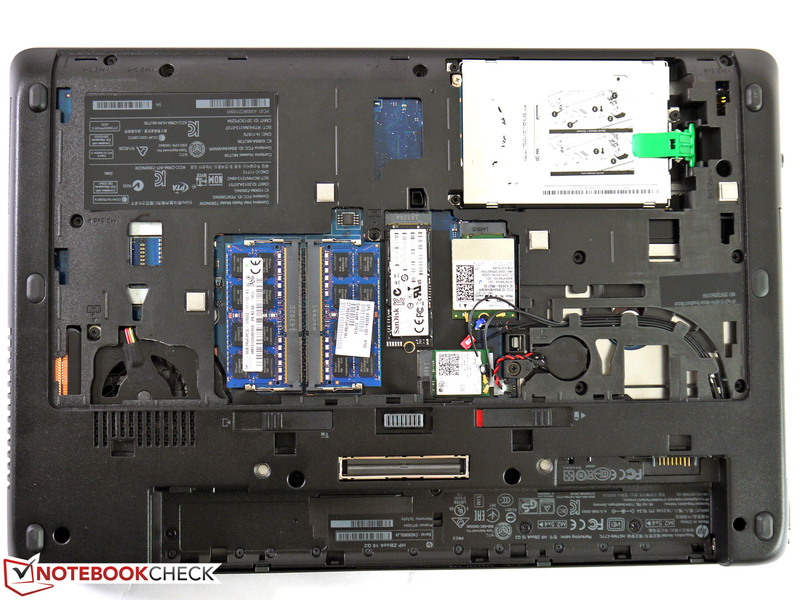 This processor is also the current "top motorization" for the ZBook 15 G2 and costs roughly 700 Euros (~$783) more than the previously tested Intel Core i7-4710MQ. Obvious differences that are to justify the surcharge are found in a 400 MHz higher clock rate (2.9 GHz to 3.9 GHz) and the L3 cache increased from 6 to 8 MB. 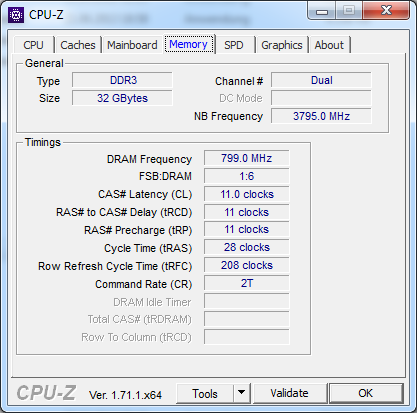 As usual, up to 8 threads can be processed simultaneously, and the maximum clock can only be expected in single-thread applications. 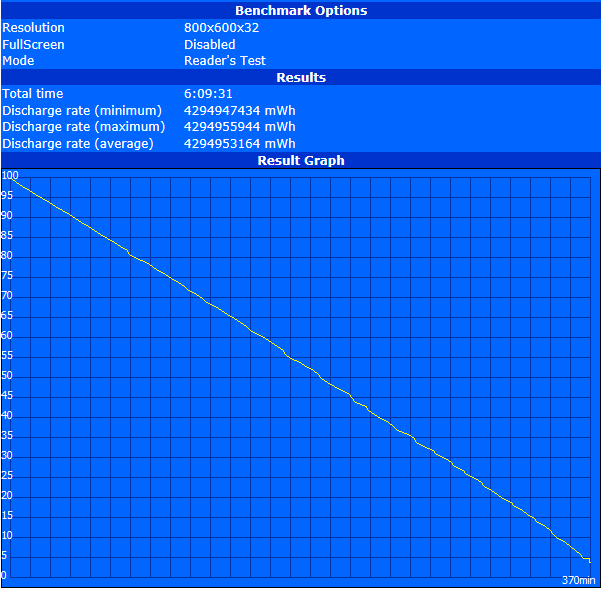 The supposedly stronger processor has to prove its real capabilities in the pure CPU benchmark tests. 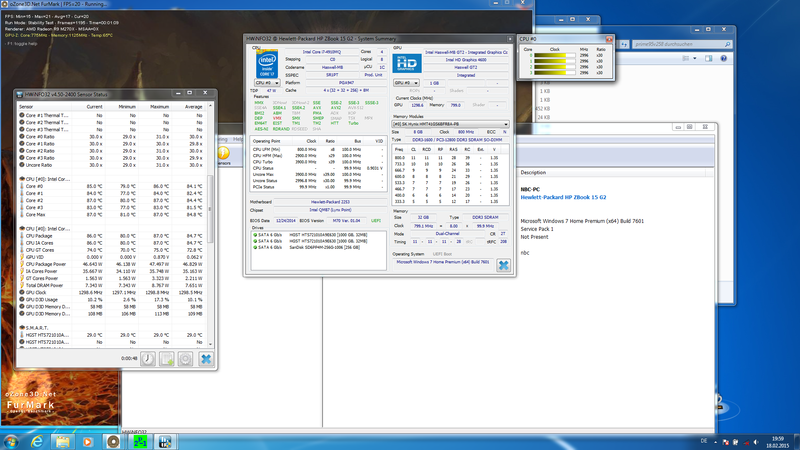 5457 points (single-core) and 19910 points (multi-core) were achieved in Cinebench R10 32-bit. It managed 1.69 and 7.05 points in Cinebench R11.5 64-bit. The scores are on a similar level with 7078 points in 3DMark06 and with 532 seconds in the wPrime 32 computation. Thus, the plus of performance that we ascertained ranges from approximately 2 to 10% compared with Intel's Core i7-4710MQ. However, the biggest increase is sooner achieved in the single-thread field and not as much in multi-core tasks. This performance gain is disappointing in view of the surcharge and only makes this "top motorization" interesting for users who want maximum computing power regardless of the price. We experienced another flop in our full-load scenario. Both the GPU and CPU are put under permanent load via Prime95 and Furmark. 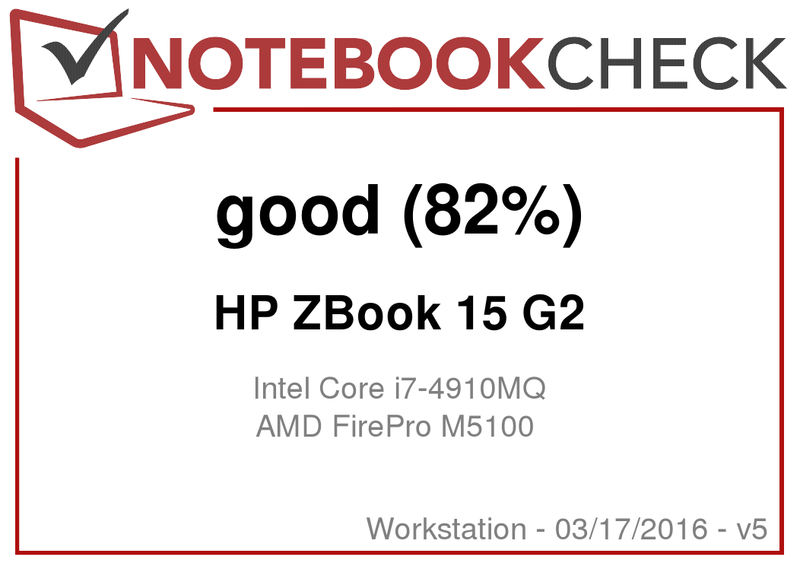 Intel's Core i7-4910MQ in HP's ZBook 15 G2 settled to 2.5 to 2.8 GHz after a short time. 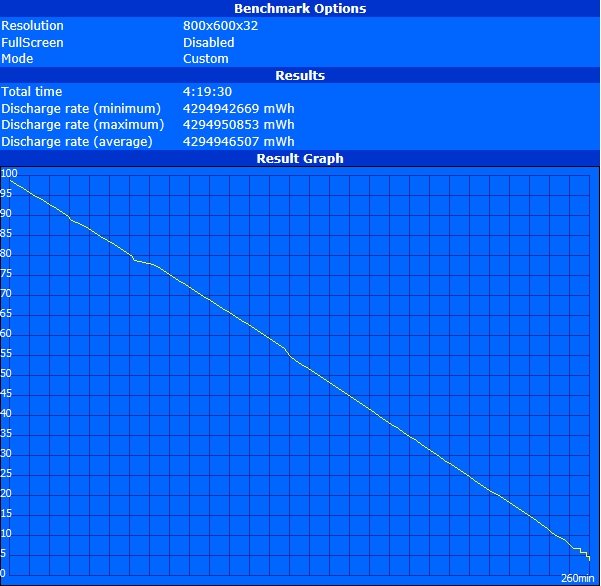 This clock rate remained stable even after over 2 hours of testing and did not drop further. Nevertheless, that is just 100 MHz more than our first review sample with an Intel Core i7-4710MQ managed a few weeks ago. The blue screen that appeared multiple times after a load phase was likely due to thermal reasons, according to the log file. We will keep an eye on that during our long-term test and report about that again when necessary. 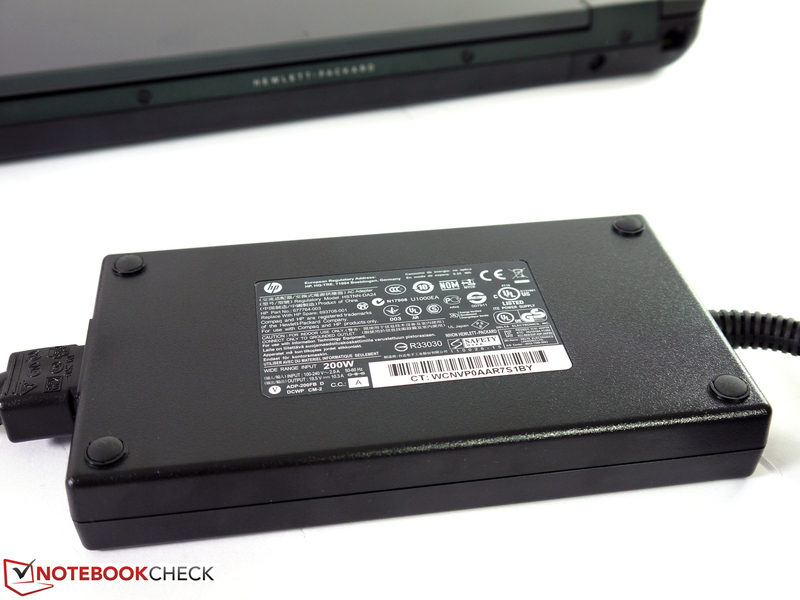 The CPU clock is throttled moderately in battery mode in favor of power consumption. We measured a lower performance of 10 to 20% in the high-performance profile. For example, 1.28 points rather than 1.69 points (single-core) and 6.32 points rather than 7.05 points (multi-core) were achieved in Cinebench R11.5. 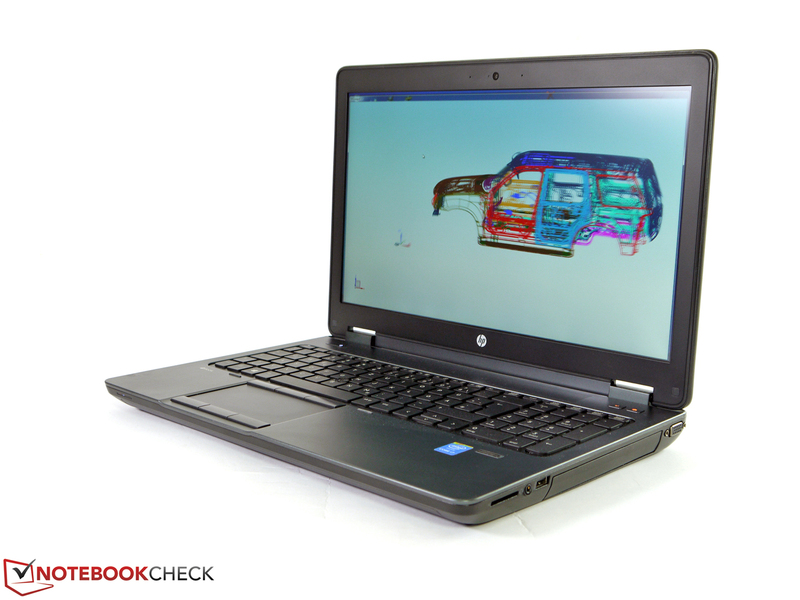 The system performance of our review sample is good and is the maximum possible for HP's ZBook 15 G2 in many areas. The M.2 system drive, Intel's Core i7-4910MQ processor and 32 GB of RAM cannot be improved upon. Even AMD's FirePro M5100 is first choice in many fields and should only be inferior to the available Nvidia Quadro options in the fewest cases. 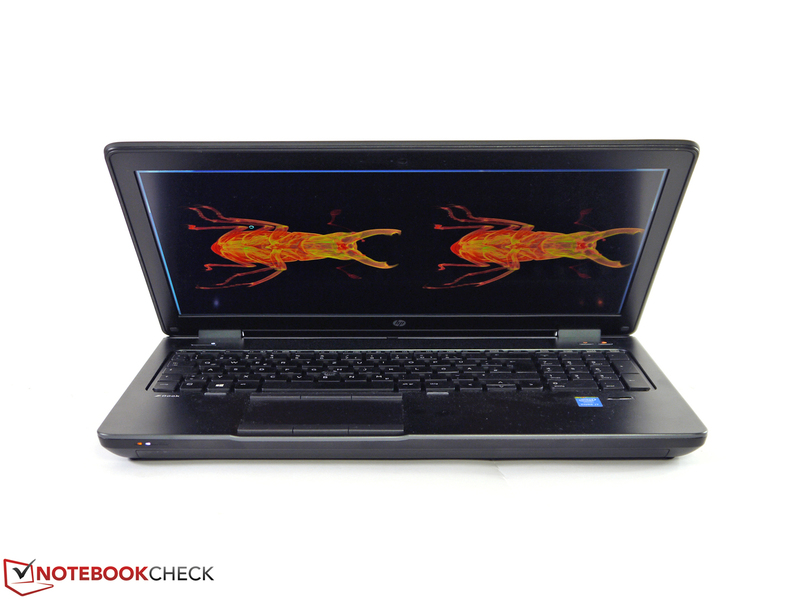 The scores of the standard PCMark system benchmarks are correspondingly good. 21302 points was achieved in PCMark Vantage and 5846 points in PCMark 7. We also performed extensive tests using PCMark 8 and achieved 4654 points (Home), 4990 points (Creative) and 5200 points (Work) in the single-test versions. 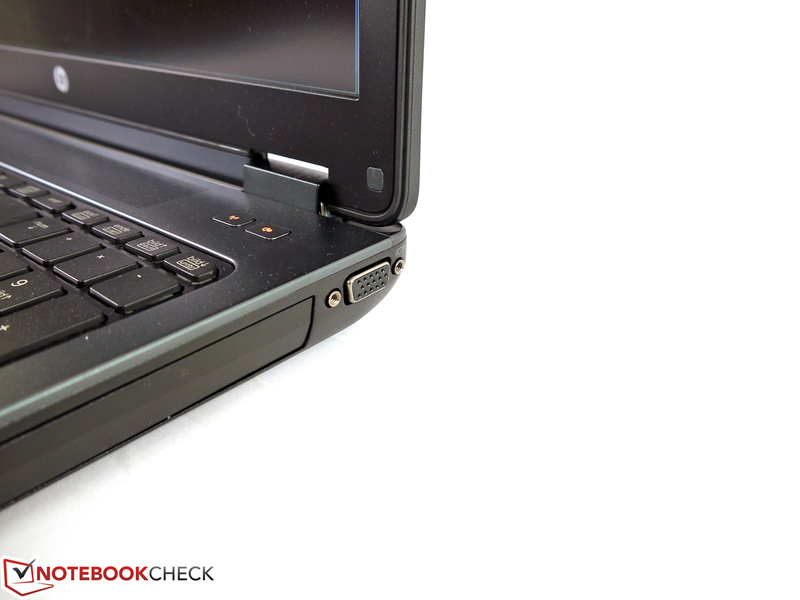 That equals an increased performance of 7 to 13% in a direct comparison with the previously tested ZBook 15 G2. The difference is even around 75% in PCMark 7. 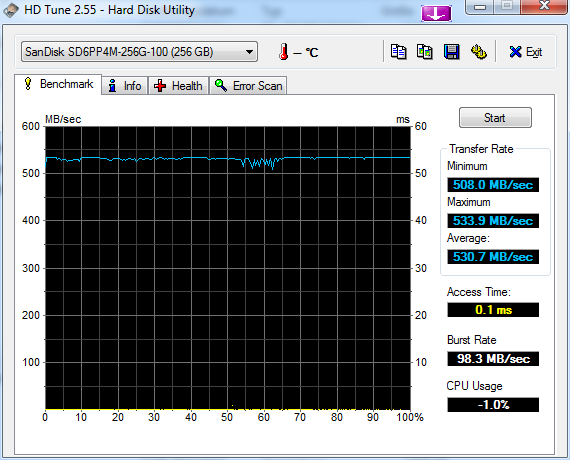 However, solid state drives are given preferential consideration with high weight in the storage test here. 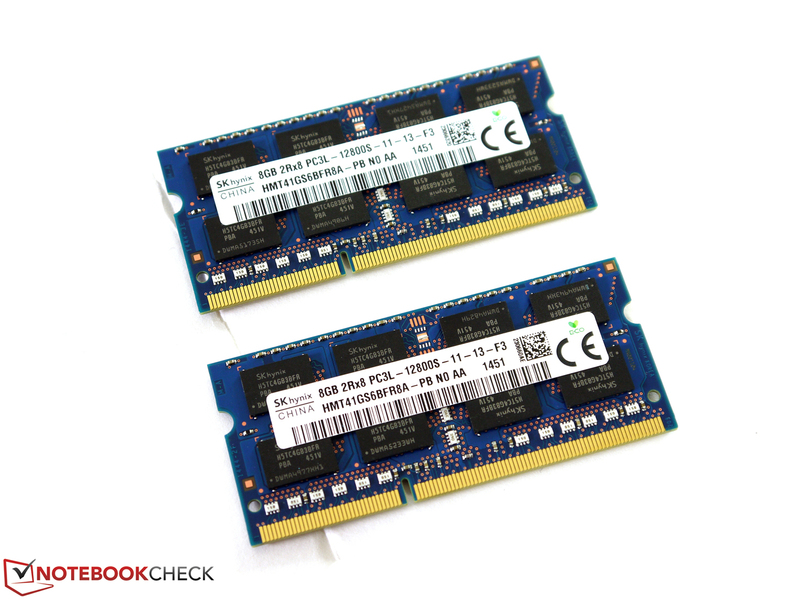 The 256 GB (gross) solid state drive is connected via an M.2 interface in the NGFF format and could deliver theoretical data rates of up to 4 GB/s depending on the placement and number of PCIe 3.0 lanes. 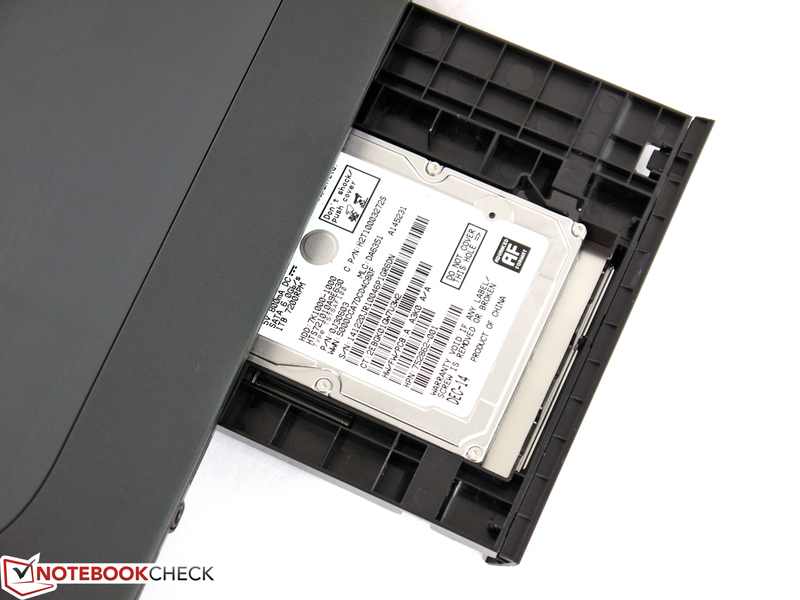 The SanDisk solid state drive in our review sample achieves considerably better data rates than the case would be with a SATA III interface. 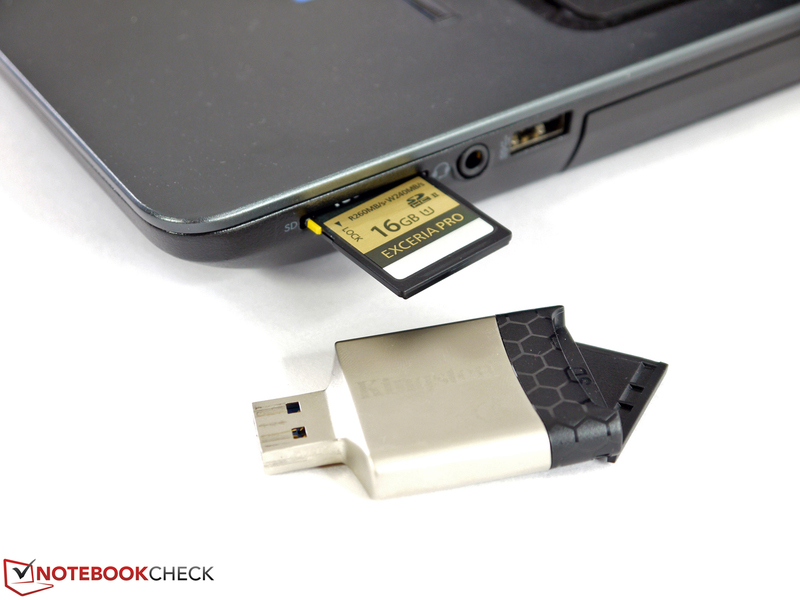 This little memory card belongs to one of the fastest storage devices that are currently found in laptops with a maximum of 716 MB/s in read and 513 MB/s in write (AS SSD). The capacity of 256 GB is throughout useful for a system drive and is quite easy to expand upon using a second or even third 2.5-inch drive (in the modular bay) when required. We configured our review sample with two 2 TB hard drives to create a good basis for the planned RAID test in the long-term test, and to ensure enough storage for data. AMD's FirePro M5100 already proved that it is a very high-performance alternative for Nvidia's Quadro portfolio. The FirePro keeps the lead in most of our test sequences and can even boast with a lower purchase price than an identical configuration with Nvidia's Quadro K2100M. AMD's GCN architecture, 640 stream processors, a core clock of up to 775 MHz, 2 GB of GDDR5 graphics memory, and a 128-bit memory bus interface are reason for the good test results. It is defeated by the Nvidia competition in the professional SPECviewperf benchmarks only in ProEngineer, TCVIS, and CATIA. There is only one unambiguous winner in the DirectX benchmarks of the 3DMark series, the OpenGL tests of the different Cinebench versions and in the GPGPU field by taking the example of Luxmark 2.0 - and that is AMD's FirePro M5100. Depending on the test, the performance difference compared with Nvidia's Quadro K2100M ranges from 2% (Cinebench R15 OpenGL Shading) and approx. 300% (Luxmark 2.0 OpenCL Raytracing). Further extensive comparisons can be made in our GPU benchmark comparison chart. 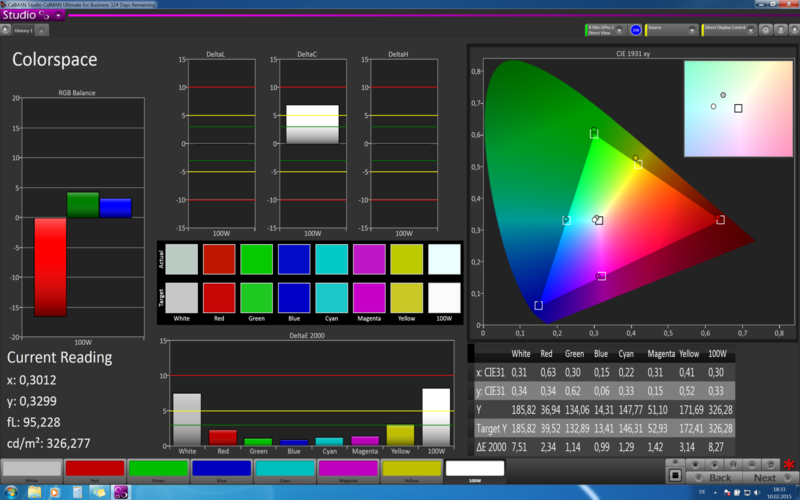 In contrast to the first review sample, the present configuration can also utilize the CPU-integrated Intel HD Graphics 4600. That provides a small power-saving potential in undemanding applications and allows using Intel's efficient Quick Sync video engine for converting videos simultaneously. 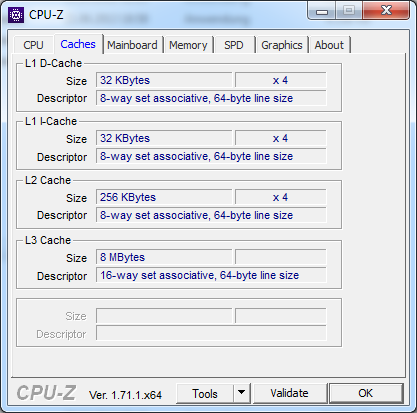 That saves time and noticeably lowers the system load compared with conventional CPU converting. The system can be comfortably used for other tasks at the same time. 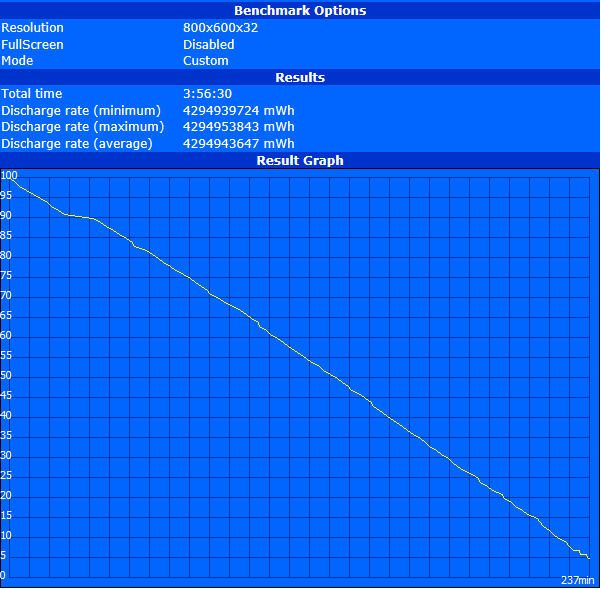 We ascertained as good as no performance losses in battery mode and during full load on the graphics card side. For example, 57.15 fps rather than 58.28 fps was achieved in Cinebench OpenGL Shading R11.5. We extensively looked at the gaming performance in our last review. All games were rendered smoothly in high test settings with the exception of Company of Heroes 2. It is, however, usually not enough for the maximum resolution and quality settings. Even the newer titles, Thief and Ryse: Son of Rome, require a lot of computing power and can only be played with restrictions. AMD's FirePro M5100 benefits from throughout higher frame rates in a direct comparison with Nvidia's Quadro K2100M and also beats it clearly in the gaming sector. 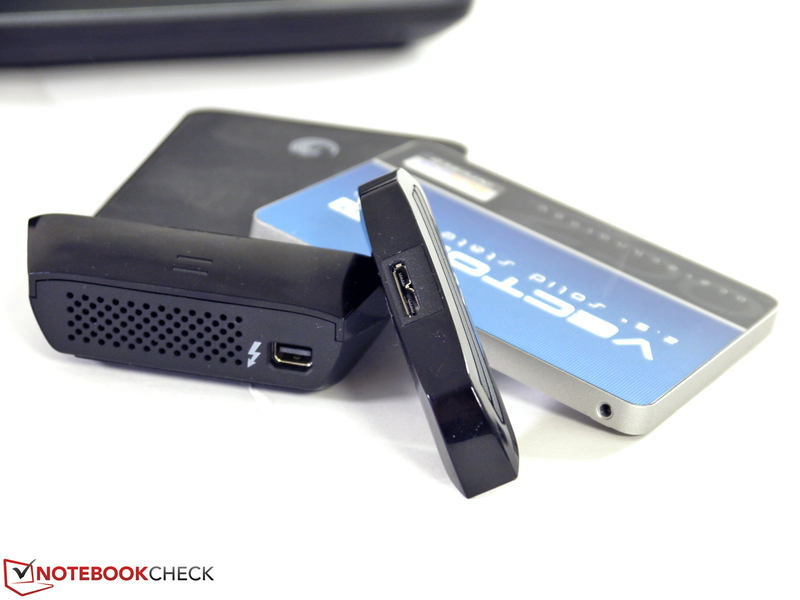 For a mobile workstation, the review sample's operating noise is overall very restrained. Principally, the conventional hard drives with a total of 2 TB of storage capacity produce a noise level of 30.6 dB(A) in idle. 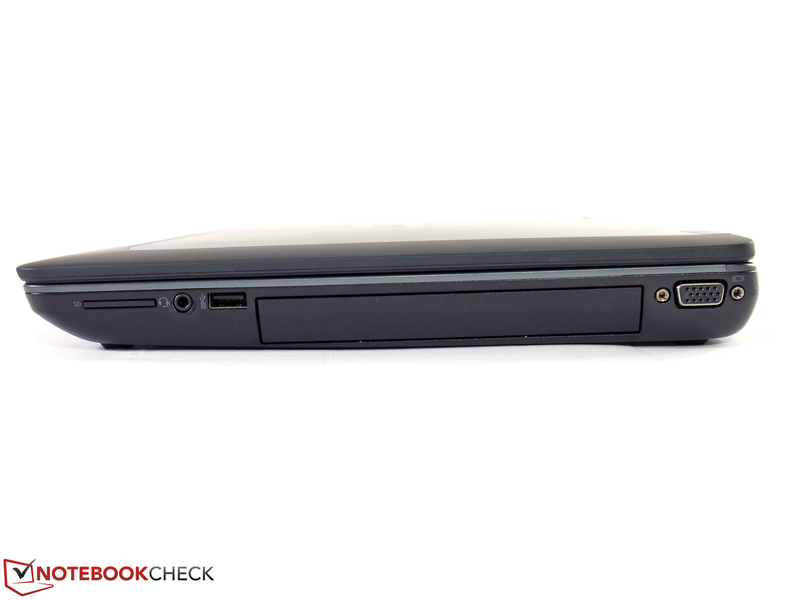 The laptop would be virtually noiseless when they are removed. The level increased to a still moderate 35.7 dB(A) in medium load. The maximum noise level is primarily reached in performance-intensive applications. 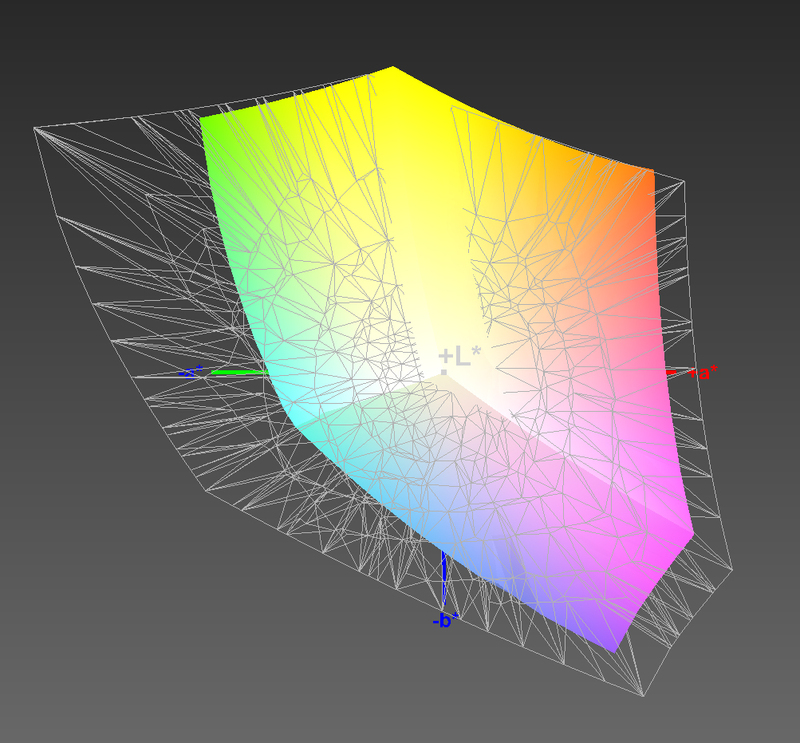 Games, converting, and sophisticated 3D construction software are the usual suspects here. The noise level of 43.2 dB(A) first gets unpleasant after a longer time and benefits from the restrained, sonorous characteristic. The fan does not fluctuate or produce high-pitched noises. The ascertained maximum surface temperatures are not higher than those of the "weaker" review sample from December 2014. 45.7 °C is absolutely acceptable when the workstation is used permanently on the desk and is generally not a restriction. As usual, the vent area needs consideration. We measured a potentially painful 64.3 °C after 2 hours of full load. The 44.1 °C ascertained in the keyboard's middle is not noticed during typing and will thus not adversely affect practical use. The "Fan always on when AC on" feature that can be enabled in the BIOS only has an impact on the temperatures in low load situations. Depending on the measuring point, they drop by 2 to 4 °C in total. We did not notice any differences during full load. (±) The average temperature for the upper side under maximal load is 36 °C / 97 F, compared to the average of 31.1 °C / 88 F for the devices in the class Workstation. (-) The average temperature of the palmrest area of similar devices was 27.8 °C / 82 F (-8 °C / -14.4 F). The speakers, installed between the keyboard and display, ensure a good and undistorted base volume that can be set quite precisely in 50 levels. The sound characteristic is treble-heavy with some mids and virtually inaudible bass. However, the quality is sufficient for videoconferencing, small presentations, and Internet videos. External solutions can be connected via HDMI, USB, Bluetooth or the 3.5 mm jack. 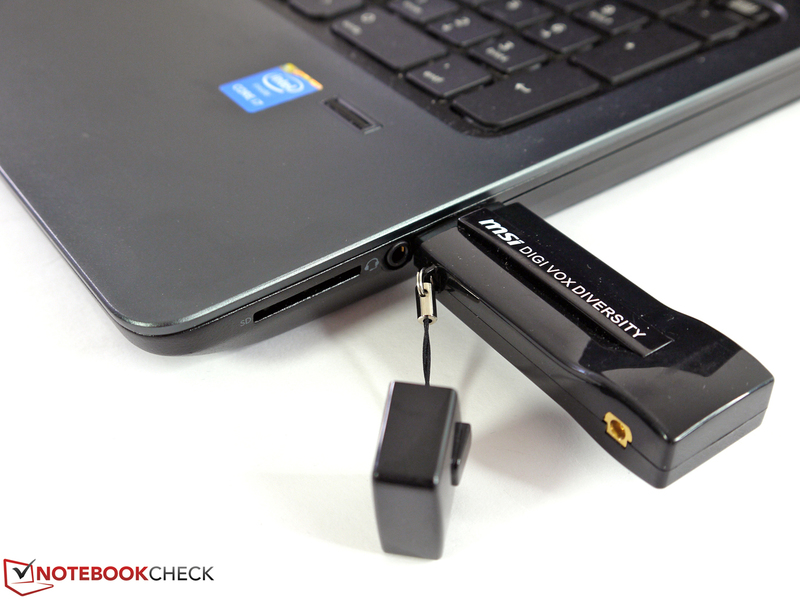 HP has combined the microphone-in and headphone-out of its ZBook 15. That has to be considered when selecting a headset or a corresponding adapter solution. The minimum power consumption of the present test configuration is a relatively high 17.1 watts (energy-saving profile, wireless off, minimum screen brightness, Intel HD Graphics 4600). 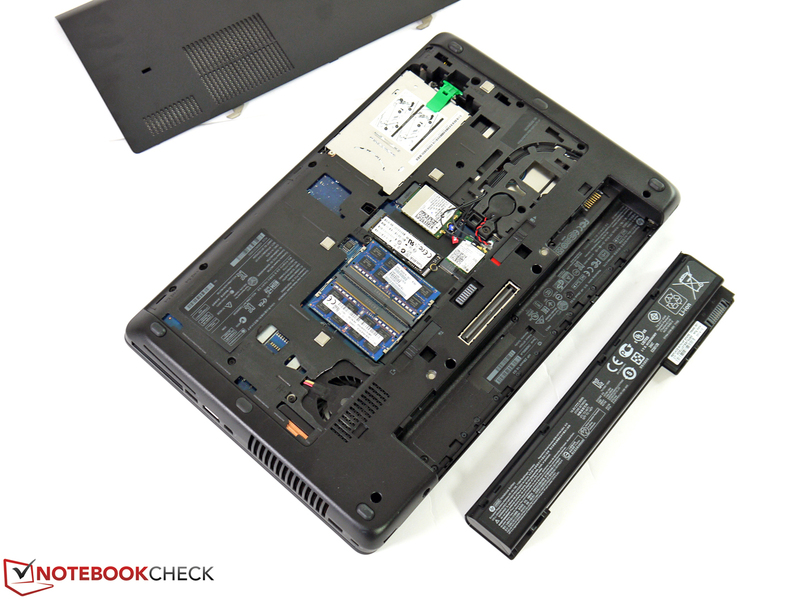 Since the screen's consumption of 2 watts is quite restrained, we ascribe the approximately 6 watts more compared with the previously tested HP ZBook 15 G2 to the different storage devices (SSD + 2 x 1 TB HDD) and the considerably higher RAM capacity. The idle consumption in the high-performance profile increases to 23.2 watts using maximum screen brightness, all consumers on, and enabled AMD graphics. Both the CPU and graphics are demanded in medium load, which leads to a consumption of 86.6 watts. We measured a maximum of 120.7 watts during full load. However, the ascertained throttling of the CPU's clock was noticed here and prevented even higher consumption rates. The power supply is specified with a nominal capacity of 150 watts, and thus it has reserves. Despite the relatively high additional consumption in AC mode, the battery runtimes are still good and can take advantage of the somewhat higher capacity battery (83 Wh). 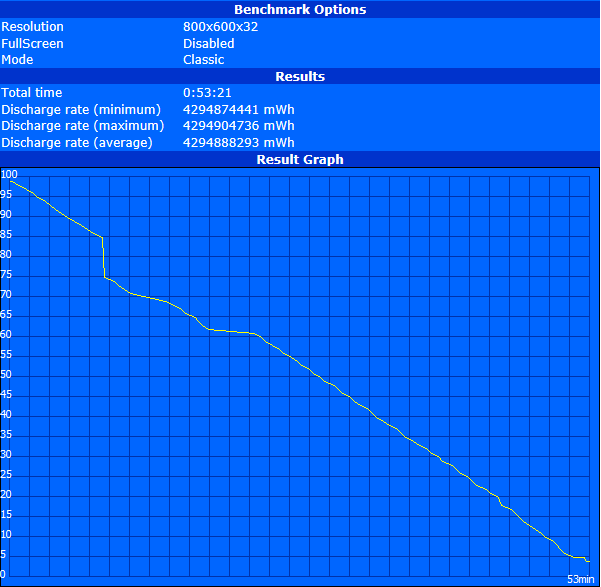 The battery lasted for a good 6 hours in Battery Eater's Reader's test (energy-saving profile, wireless off, minimum screen brightness, Intel HD Graphics 4600). The user can count with roughly 4 hours of battery power according to the more practical Wi-Fi and video tests (energy-saving profile, 163 cd/m² brightness). The reworked HTML5-based Wi-Fi test is new (163 cd/m², balanced profile, Intel graphics), which will gradually replace the former test. The review sample managed approximately 40 minutes more here. As expected, the battery is depleted sooner during load. Just 53 minutes of runtime was possible using Battery Eater's Classic test (maximum performance, maximum screen brightness, AMD graphics, all on). 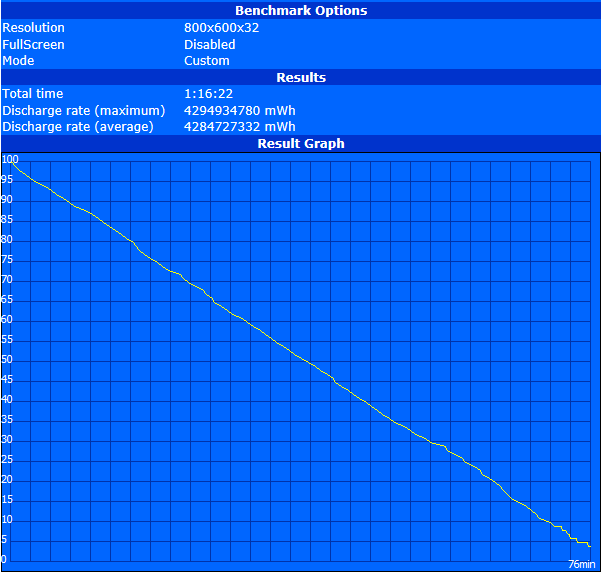 The supplementary workstation test, running SPECViewperf in a loop, still managed 76 minutes. We will look at the one or other secondary battery in the course of the long-term test and test for optimization possibilities relating to the installed software (efficiency). Not least, the choice of the browser or video players could have a significant impact on battery life in routine use. We will also replace or remove some components to track down the additional consumption compared with the first review sample. 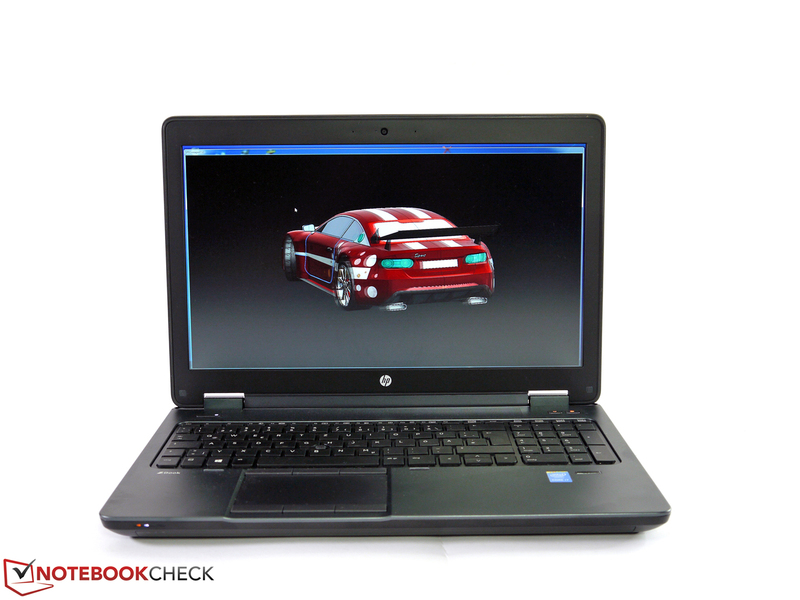 HP's ZBook G2 made a good impression in the standard test procedure and in the first part of the long-term test. Its performance is appropriate for the category, the emissions are very restrained, and the configuration can only be improved in very few areas. 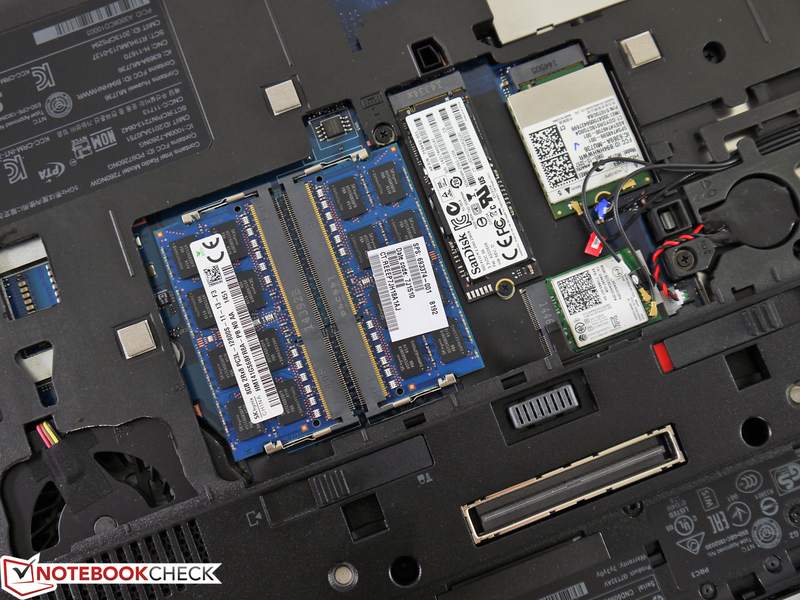 The comparison with HP's ZBook 15 G2 tested a few weeks ago proves that the marginally strongest CPU configuration does not inevitably lead to noticeable performance leaps. 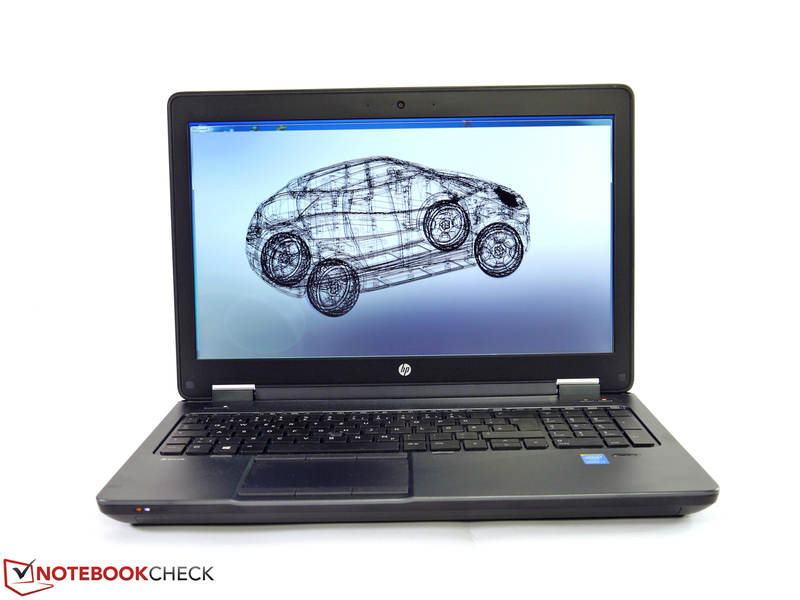 However, the basic qualities of HP's ZBook 15 G2 are still definitely on a reference-worthy course. We barely find reasons for criticism in the fields of casing stability, maintenance, upgrading or warranty options. Here, the important added value becomes evident as opposed to many other device categories that are designed for home use or consistent mobility. 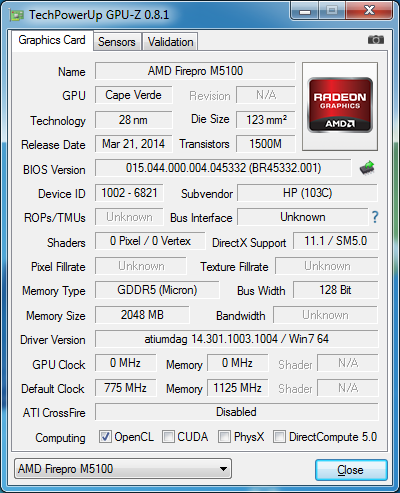 HP does not show weaknesses in important interfaces for the user. The input devices and the screen gave a very good performance and meet the demands of professional customers. But, room for improvement is found in connectivity. The positioning and performance are overall good, but their implementation could be even more suitable for practical use, which would also increase productivity. As announced, the review sample will be observed closely for some months in the seamlessly following long-term test. The planned program is extensive and will particularly deal with the reliability in tough daily business routine. The first results and impressions will likely be available in about 3 weeks in an extra long-term test article. 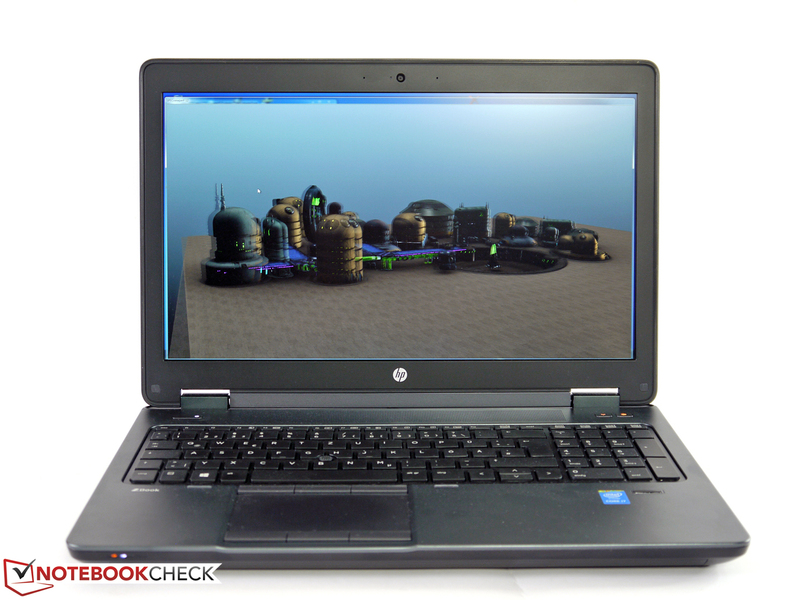 HP's ZBook 15 G2 is a conventional mobile workstation. It fuses very good basic qualities with a great amount of flexibility. We will illustrate the quality of its durability in a long-term test for the first time. ...and performance could be improved. The input devices are absolutely satisfactory. However, the number pad pushes the touchpad off center. The security features are extensive and protect against potential data theft. ...for wide extensions. Neighboring ports are then often blocked. ...especially when there is no docking station available. Missing interfaces can also be retrofitted via ExpressCard/54/34 expansions. However, the accessibility of neighboring ports is poor even then. 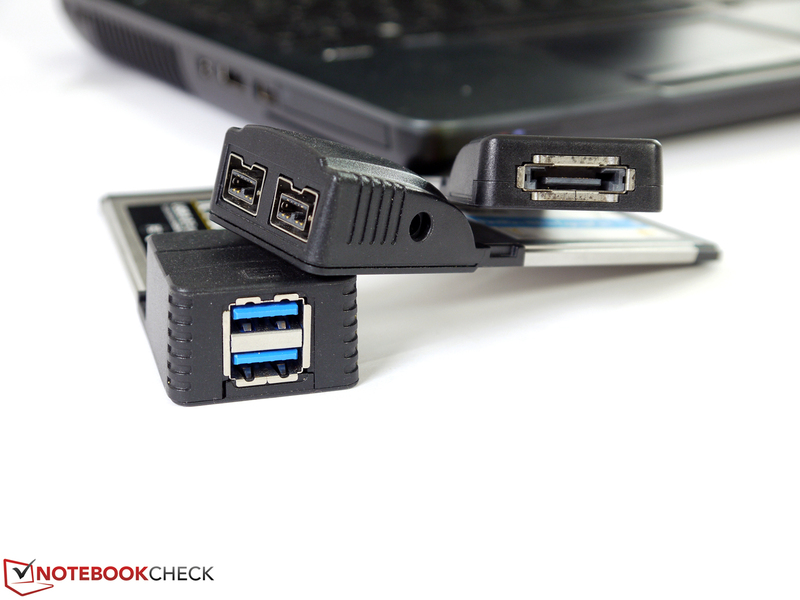 External storage devices can be connected via Thunderbolt 2 or USB 3.0. The integrated card reader achieves almost 90 Mbps. Some external models are considerably faster. 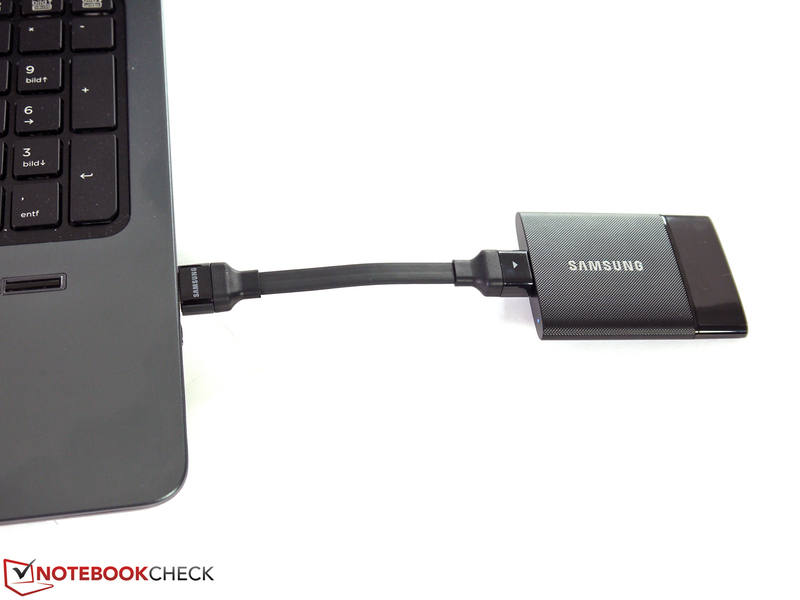 The USB 3.0 port in the review sample reached a maximum of 221 Mbps. That unnecessarily slows down high-performance storage devices. Modular drives are secured with 4 screws in the modular bay. Thus, hot swapping is barely possible. The screw-less baseplate enables easy access to the components. 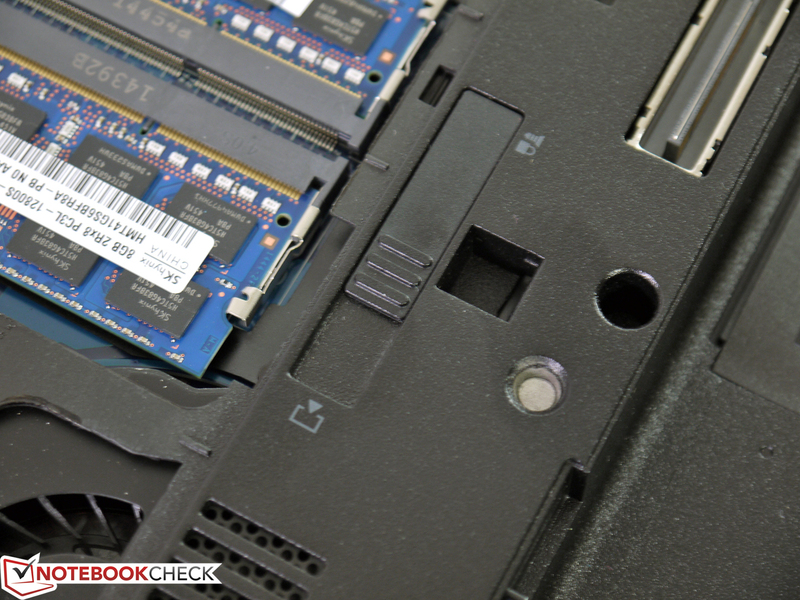 While two RAM banks are easy to access, two more are under the keyboard. That is not very relevant for the review sample because we have the maximum configuration of 32 GB. The baseplate is closed via a slider system. 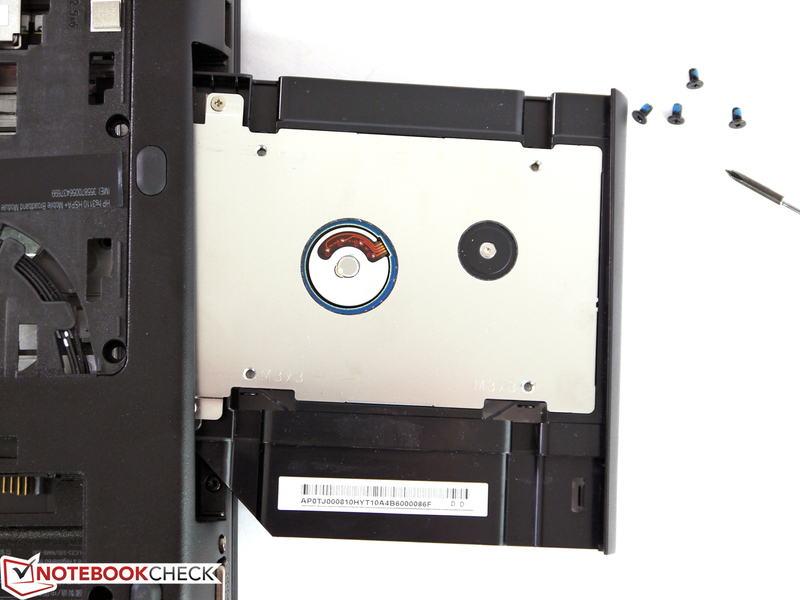 The first hard drive is also secured with screws. 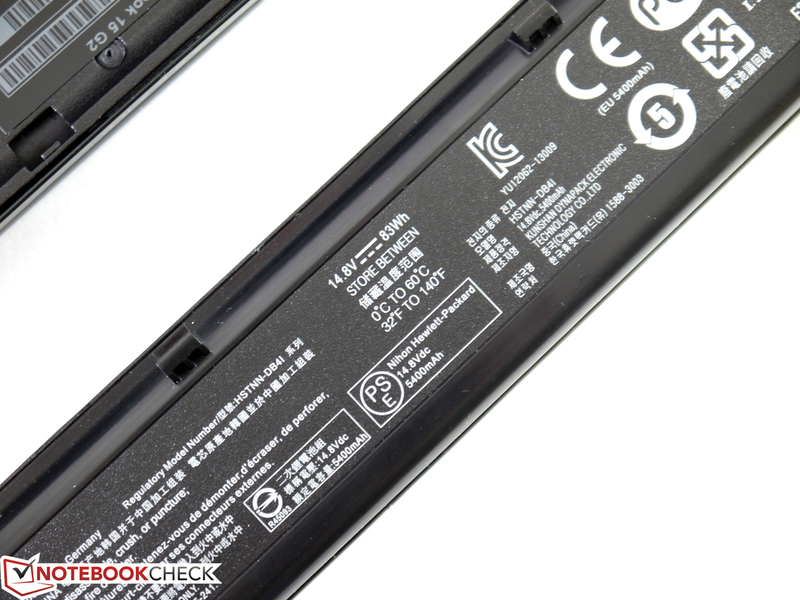 The standard battery has a capacity of 83 Wh. 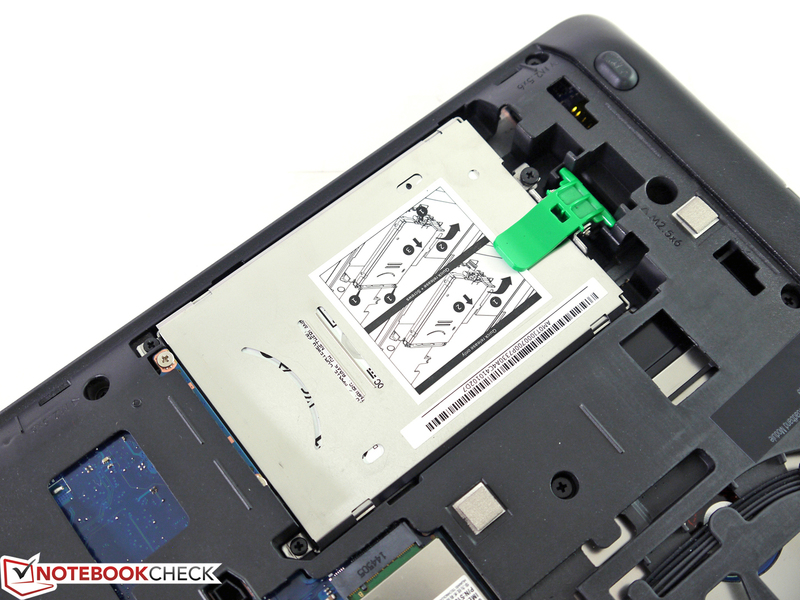 The SIM slot for the Huawei WWAN module is in the battery compartment. The power supply has a nominal capacity of 150 watts and weighs a heavy 730 grams. 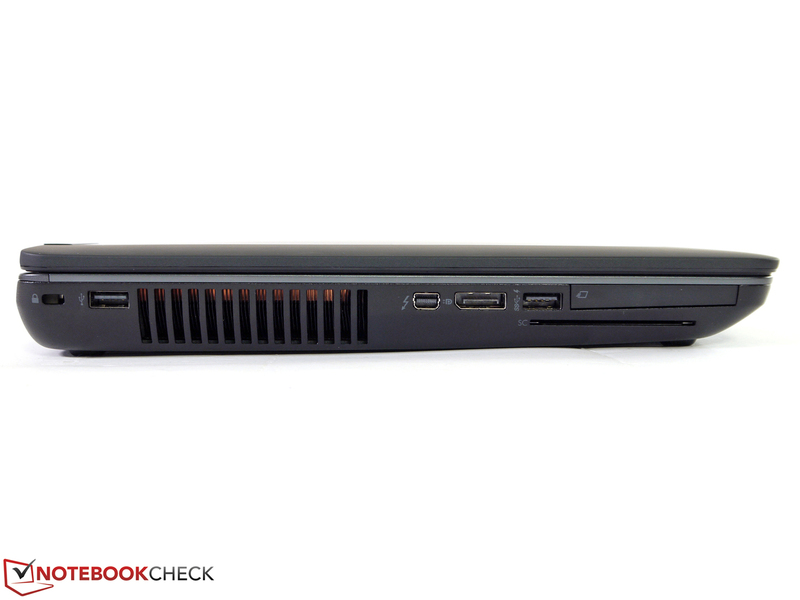 With the ZBook 15 G2, HP offers a classic workstation that can be well customized to meet personal needs. Beyond that, the maintenance and upgrade options are exemplary and are a welcome added value in contrast to fashionable slim-line workstations. Interface positioning more suitable for practice, and configuration prices more suitable for the market. That Intel's Core i7-4910MQ clearly lags behind expectations.